Three Media Scape tables are located on the left side of the Learning Commons, near the Research Consultation Desk (LC-1 to LC-3). Each Media Scape study table has a 42" HD monitor and an HDMI cable. 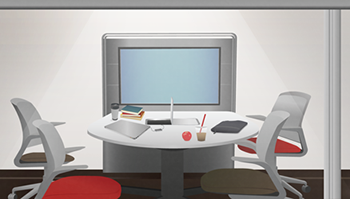 You can display the desktop of your laptop, tablet, and/or phone onto the TV screen for collaborative group work. The Library Technology Services office offers 3-hour checkouts of HDMI adapters for various devices. You may also checkout a 4-way HDMI splitter box to connect up to 4 devices to the screen at a time for up to 3-hours. Located next to the Research Consultation Desk (LC-4 to LC-7) and Instruction Lab A (LC-8 to LC-11) are see-through glass Collaborative Study Rooms. These study rooms cannot be reserved online and are instead used on a first-come first-serve basis. There is a minimum of two patrons allowed in each room. Reserve a study room on the 2nd, 3rd and 4th floors.